Brazil has approximately 4,700 miles of coastline. As you might imagine, it has quite a few nice beach towns. For my money, Cabo Frio is among the very best.Cabo Frio, which means “Cold Cape,” lies less than 100 miles up the coast from Rio de Janeiro. Cabo, at around 175,000 permanent residents, is the largest town in what is known as The Lakes Region (Região dos Lagos in Portuguese). Here a string of freshwater “finger” lakes and brackish lagoons lies just inland from the South Atlantic shore. The region’s topography means two things: lots of seafood, and lots of water activities. Accordingly, Cabo is a popular vacation spot, and in the summertime (December to February), tourists flock in not only from Rio but from as far away as Brasília. If you enjoy sun and water sports, you’ve got it all here: freshwater and deep-sea fishing, kayaking, sailing, surfing, kite surfing, sailboarding, and stand-up paddling. Boats run daily snorkel tours, and the diving in this area is regarded as among the best in Brazil. Of course, you might prefer to linger over a coconut, go beachcombing, or simply claim your patch of sand. Nothing wrong with being a beach bum once in a while. Cabo is easy to explore on foot. 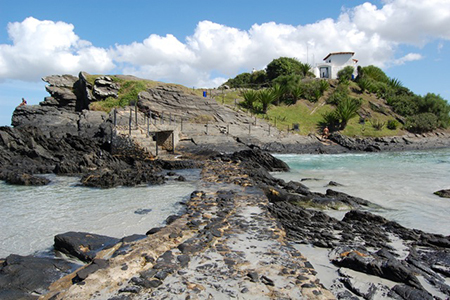 Begin at the tourist office located at the southern end of Praia do Forte (Fort Beach). This is the longest of Cabo’s nine beaches, stretching unbroken for more than 4 miles. Praia do Forte is broad and surprisingly pristine. The white sand is so fine that it often squeaks when you tread on it. Although the currents bring cold water from the south, the gradual slope here creates shallows near the shore that are warmed by the sun. A dozen shades of blue spread out before you. As you work your way up the beach toward the fort, you’ll encounter itinerant vendors selling everything you might need: suntan lotion, kangas (beach wraps), sunglasses, cold beer, even bootleg DVDs. 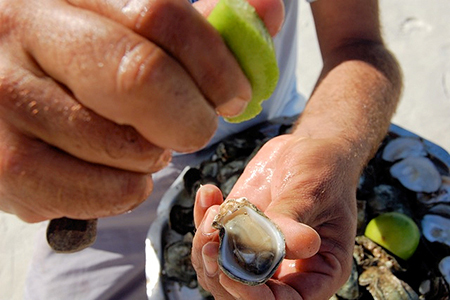 How about a half dozen oysters, sprinkled with lime juice? Man, this is livin’! 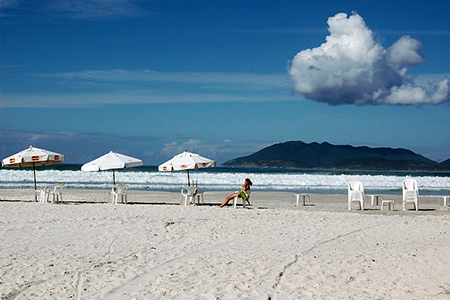 As you walk, you’ll notice the active beach life at Cabo Frio. Stop and watch the couple playing paddleball, the surfers, the man catching fish with a traditional hand net, or the kiteboarders who sometimes soar 15 feet or more above the crests. After your explorations, you might be getting hungry. 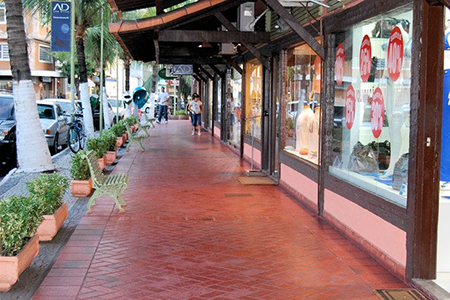 Take Avenida Nilo Peçanha, which skirts the downtown area, across toward the Itajuru Canal. Here you’ll find restaurant row. There’s a good variety of cuisine, but with emphasis on seafood, sushi, and churrasco (Brazilian barbecue). Be aware that here (and across Brazil) many dishes are intended to be for two diners, and often they will feed three. Afterwards, you may want to stroll up to Feliciano Sodré Bridge and cross the canal to the Gamboa shopping district… or you might prefer to visit the Surfer Museum downtown. I really like the relaxed, healthy lifestyle that you find in Cabo. But, as those TV commercials implore, “Wait, there’s more!” When you stay in Cabo, you get two bonuses thrown in: Búzios and Arraial do Cabo. Armação dos Búzios, known locally as Búzios, is a chic little town of 25,000 which can be reached from Cabo by local bus. It makes a wonderful day trip or romantic weekend getaway. The town is lovely, comprised principally of two parallel streets of stone. Búzios, which sits on a peninsula, is also surrounded by 20-some beaches, each with its own personality. Hire a guide with a car and see where the day takes you. I also highly recommend a day trip to Arraial do Cabo, which can also be reached by local bus. 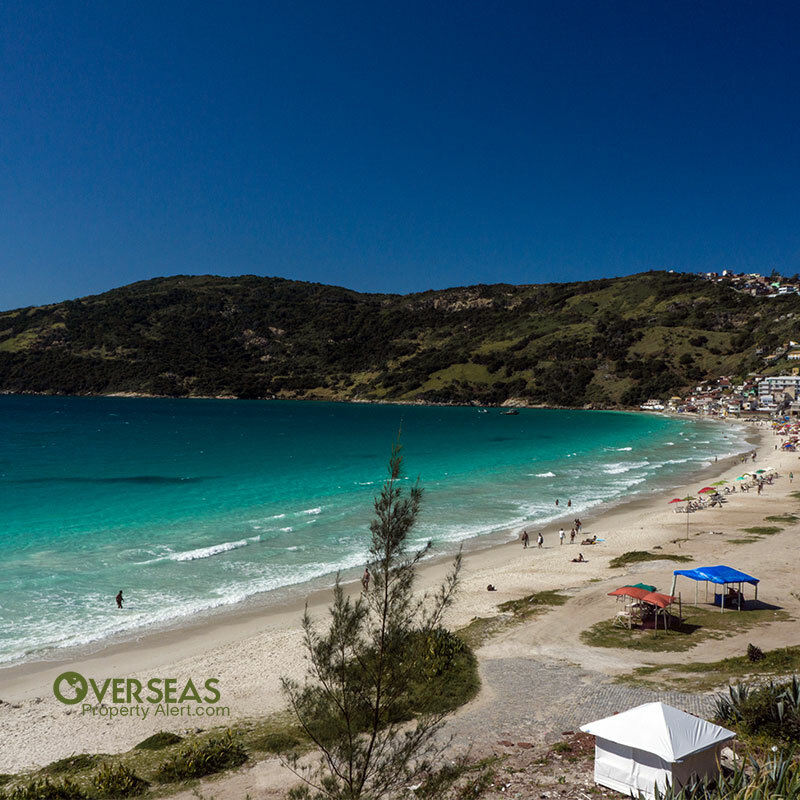 Whereas Búzios is chic, Arraial is still an unpretentious fishermen’s village, even today—except that many of the fishermen have turned to running excursions to the nearby islands. You owe it to yourself to take one of these tours, which last about 5 hours. Some of the beaches visited are simply breathtaking. Many can only be reached by boat, so they aren’t inundated with frolickers. Although there are schooner tours to these same areas departing from the canal district in Cabo, I’d pass on those in favor of a boat tour offered by the fishermen of Arraial do Cabo. If you’re looking for a furnished apartment to rent while exploring the area, I found a one-bedroom apartment for rent. They’re asking 1,200 Brazilian reais plus the 300-Brazilian-real monthly condo fee, which comes out to approximately US$470 per month. Right in Centro, I found a one-bed, two-bath unit for sale. It’s only five minutes from the beach and convenient for nearby shops. The asking price is US$119,000 at today’s exchange rate (380,000 Brazilian reais). Also in a great location is a two-bed, two-bath unit for sale for US$125,000 (400,000 Brazilian reais). This one has good project amenities, including a pool, game room, gym, event room, and barbecue area. If you’d like something larger, you can have a three-story, single-family home for just a bit more money. This large home has five bedrooms, four baths, an attractive, large terrace, and a big game room currently equipped with a pool table. The large barbeque area is the centerpiece of its outdoor living areas. The asking price is US$172,000 at today’s exchange rates (550,000 Brazilian reais). If renting, be aware that in Brazil tenants are generally responsible for paying the monthly condominium fees, electricity, and often property taxes. However, for short-term rentals the owner often pays these. The current market strongly favors the buyer or renter, so look at a few places and don’t be afraid to bargain. I have always liked Cabo and the surrounding area. I also believe that there are opportunities to buy now and enjoy gains when the economy rebounds. From mid-December until after Carnaval (late February to mid-March, depending on the year), Cabo is crowded… maybe too crowded for some. You’ll find very few gringos here. This is either a plus or a negative, depending on your perspective. The water is generally chilly, although less so in the shallows. Cabo Frio is a good-sized place, offering everything you need without big-city problems. It’s close to Rio and easily accessed. The cost of living is very reasonable. It’s a good place to own a rental property. The area is diverse, so you can stay active and stay interested. Cabo is a great place to spend part of the year, but I would avoid the December-to-February high season. Personally, I think that June to August, which are the dry winter months, are nicer. Cabo could be your place to shed a few pounds, get a tan, and recharge. If I bought a home with a self-directed IRA, can I rent it from myself? Or can I rent it myself if I set up an LLC as owner of the home? This is probably the most frequently asked question about purchasing property with an IRA. And the answer is definitely “no.” Under no circumstances can you rent your own IRA-owned property. Same goes for your parents, children, and spouse. I noticed in last month’s issue of Overseas Living Letter you referred to [Nicaragua] as a non-apostille location. I have seen the residency process for Nicaragua documented in many places and some refer to the consulate approval and others refer to the apostille. Some lists for the Hague-signed countries lists Nicaragua and others do not, making this confusing. When I bought land in Gran Pacifica I had to use an apostille. When we apply for residency, which way should we go… the apostille process or consular legalization? I can understand the confusion… including my own. The Hague Convention on the apostille process (officially called Convention of 5 October 1961 Abolishing the Requirement of Legalization for Foreign Public Documents) does not list Nicaragua as a member state. But in fact, Nicaragua joined the apostille convention in 2013 as a non-member state. So Nicaragua can accept apostille-certified documents as of 2013. But remember, the organization receiving the documents has the final word. So when you apply for your visa, follow the advice of the consulate with respect to the authentication that’s required. I’ve had consulates enforce stricter requirements… and recently have had a consulate waive authentication altogether. In other apostille news, Chile has now joined the convention as of Aug. 30, 2016. I moved to Ecuador in January 2015. I now have a cédula, bank account, house, etc. Why are you no longer recommending Ecuador? Is it because of the earthquakes, the government, or because we need to pay in USD? I’ve gotten a number of emails like this one, and I can’t recall ever recommending people away from Ecuador. I think Ecuador is just perfect for many people. Granted, the recent earthquake on the central coast has caused much destruction and has taken a lot of the coast off the market… but Ecuador still holds a lot of great opportunities. The cost of living is low. And the rich Andean culture, Spanish-colonial environment, and colorful indigenous presence create an environment that’s almost impossible to duplicate. Most importantly, there are thousands of expats who live in Ecuador and love it there. With that kind of testimony, you don’t need to be concerned about what you read (or don’t read) in newsletters. Have a question? You can write to Lee here. Hard Money Loans In Real Estate: Scam Or Real Opportunity? John Clites is a U.S. citizen currently living in Brazil under permanent residence. 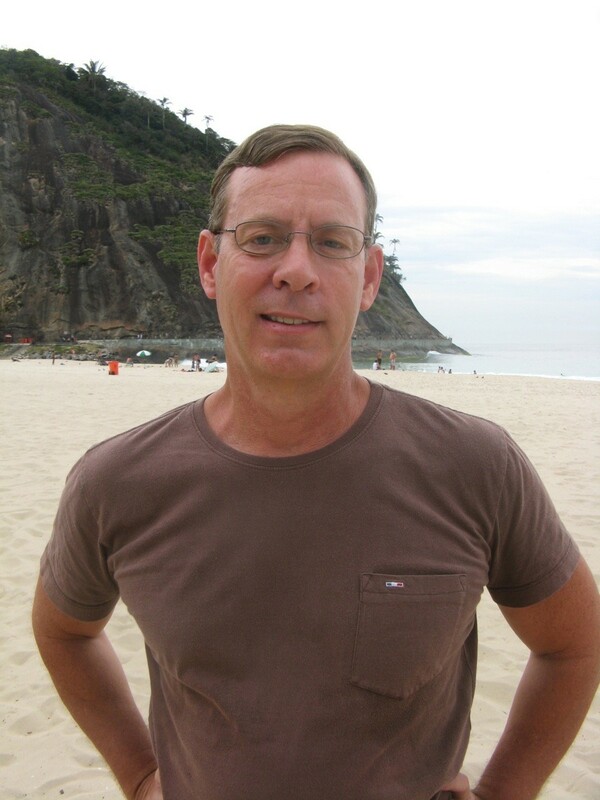 He divides his time between teaching English, writing about Brazil, and maintaining an on-again, off-again blog.